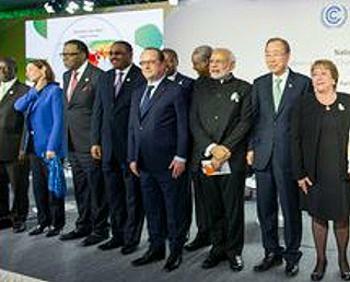 PARIS, France, November 30, 2015 (ENS) – India’s Prime Minister Narendra Modi today launched the newly formed International Solar Alliance at the opening day of the COP21 climate talks in Paris, inviting 120 countries with ample sunlight to implement solar projects and infrastructure. With his partner in the alliance, French President François Hollande, at his side, Modi said India will host the initiative at the premises of its National Institute of Solar Energy. “To my long cherished dream of an international alliance of solar-rich countries, President Hollande responded with keen interest and immediate and full offer of support,” told the packed hall. India will provide land and contribute US$30 million to build the alliance’s secretariat, Modi explained. India will support the alliance’s operations for five years, and will work with partners to raise long term funds to achieve its goals. “We want to bring solar energy into our lives and homes, by making it cheaper, more reliable and easier to connect to grid,” the Indian leader said. The new body, has invited all countries located fully or partly between the tropics of Cancer and Capricorn to join the alliance. “We will attract investments in the solar sector, encourage joint ventures and develop innovative financing mechanisms. We will partner with other international initiatives on renewable energy,” Modi said. The alliance, formally named the International Agency for Solar Technologies & Applications, brings together developed and developing countries, governments and industries, laboratories and institutions in a common enterprise. India has a capacity of four gigawatts and has set a target of adding 100 GW of solar power by 2022. 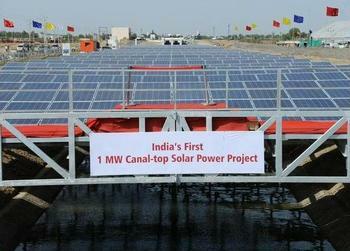 “By the end of next year, we will have added another 12 GW,” Modi said. “I am delighted with the industry response. As you put clean energy within the reach of all, it will create unlimited economic opportunities that will be the foundation of the new economy of this century,” Modi enthused. “Under India’s leadership, the ISA could inspire and support several developed and developing countries to advance on a clean energy pathway by lowering financing costs, developing common standards, encouraging knowledge sharing and facilitating R&D collaborations and co-development of technologies to meet the Sustainable Development Goals (SDGs) announced earlier this year,” said Ghosh. India has set the ambitious target of deploying non-fossil fuel electricity generating systems that supply 40 percent of the country’s cumulative installed capacity by 2030. UN Secretary-General Ban Ki-moon said the United Nations will work closely with the International Solar Alliance and commended India’s success in adopting solar technology, particularly solar projects in the state of Gujarat.